← Run hard. Run fast. No excuses. After years months of negotiation, reviewing routes, location, timing, and swag for various organized runs, Big Brother and I finally put our hats in the ring for the Vancouver BMO 8 km route to be our second annual sibling rivalry run. By all accounts, this run had everything. The timing was perfect for both of us, it wasn’t during the height of the summer heat or summer travel, it features a beautiful scenic route around Stanley Park, and it’s for the most part a flat run, which Big Brother emphasized was important (you will recall the hill that broke him in our last run). The distance was also a compromise for both of us. 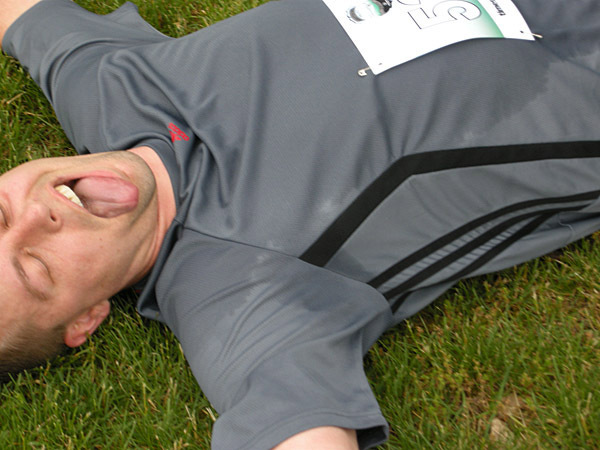 It wasn’t 5 km, which Big Brother wanted, nor was it 10 km, which I wanted – a happy medium. 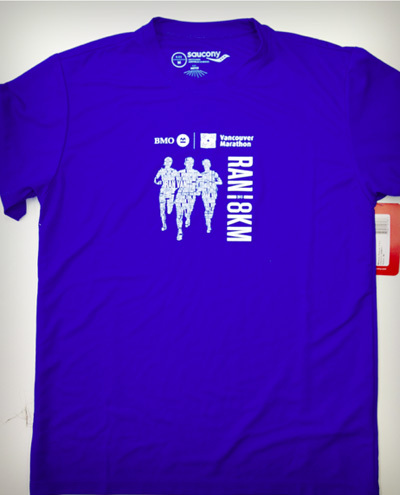 And the technical shirts, they’re kind of, totally awesome! The competitive ribbing was only just beginning when the whole arrangement came to a crashing halt Monday evening when I was informed of the start time – 6:30 a.m.!!! Are you kidding me? Most marathons don’t even start at that time! 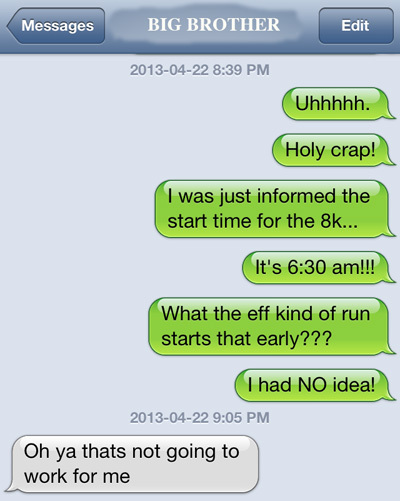 I had NO idea, I thought for sure it would be like other 5 and 10 km runs that start around 8 a.m. – not 6:30 a.m.!!! Future note: do not assume, never assume! Now, normally I’d call him out on it, tell him it was a convenient excuse, that he was just wimping out, but here’s the thing, I’m not much of a morning person myself, but Big Brother is like death that early in the morning. And because he lives more than an hour away from the start, he’d have to be leaving his house at like 4 a.m.!!! Take note guys, the following sentence contains info that some of you may find TMI. You have been warned. … I am going to have the heaviest, leakiest breasts on the planet! The start of the run is a half hour before I typically feed Little Ring, and I’m pretty sure there won’t be enough time to pump – so that’s like 1,000 pounds of milk ready to burst free. Yeah that’s not going to be comfortable at all! 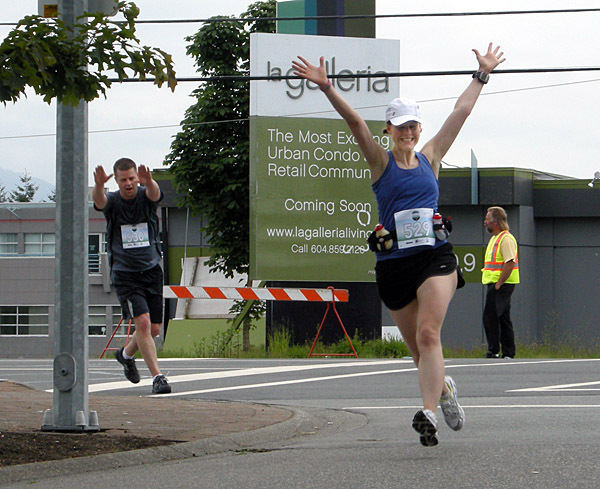 Any suggestions on a 5-10 km run in the Vancouver/Lower Mainland area that could be designated the next sibling rivalry run? 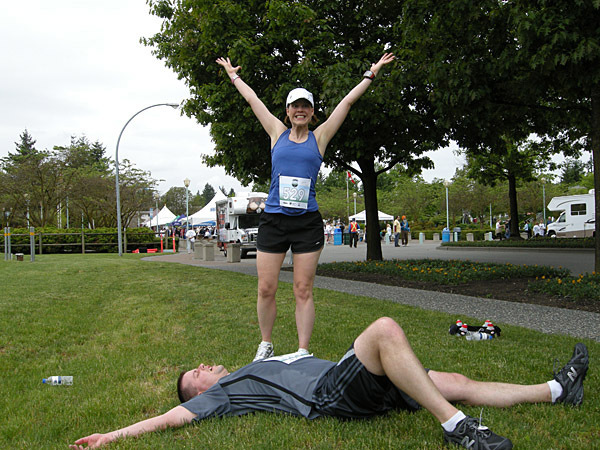 This entry was posted in Diabetes, Races, Running, Uncategorized and tagged BMO 8 km, breastfeeding and running, running, running fuel, sibling rivalry run, Stanley Park, Type 1 diabetes, Vancouver. Bookmark the permalink. You won’t be all by your lonesome. I will be there too. As for local run…how about the Run for Water? A thousand pounds of milk!!!!!? I gotta be reading this all wrong!!! Or this Sibling Rivalry Run should make it into Ripley’s Believe It Or Not! !